It's not easy to find space for a 30 acre road junction in inner suburbia. Planners therefore took the unusual step of appropriating part of the city's canal network as their construction site. 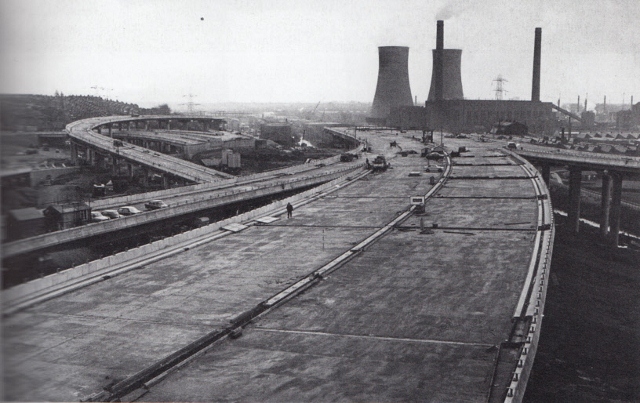 They alighted on Salford Junction, the lowest point on the Birmingham Canal Navigations, and proceeded to drive the M6 motorway directly over the top. The longest viaduct in the UK touches down at Gravelly Hill, descending for several hundred yards above one of the feeder canals, with several concrete pillars rising tall out of the water. There's a river alongside too, hence an area untouched by housing, and that's where Spaghetti Junction's vast footprint touches down. It really is a most peculiar sight viewed from beneath - a lofty urban forest rising from the waters of the Industrial Revolution. If you're visiting without a car, one of the best ways to approach is up the Birmingham and Fazeley Canal from Aston station. Birmingham's canals aren't especially wide, the locks in particular only one narrowboat wide. The towpath rises and falls for three quarters of a mile, allowing access to a number of cuts lapping perpendicularly between restored warehouses. A few yards before Salford Junction a river, an actual river, flows directly underneath the canal while the M6 thunders loudly across. 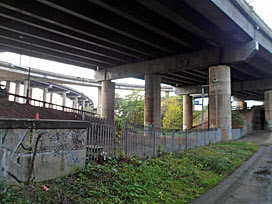 To one side is Salford Bridge, the only roadway deemed necessary hereabouts in 1926, its elegant brick arch in sharp contrast to the featureless overpass above. Will you follow ahead and underneath, or will the presence of hoodied local youth put you off? Salford Junction turns out to be Spaghetti Junction's 18th century equivalent. The Birmingham and Fazeley Canal sweeps through on a grand curve, while two others sweep in and terminate on either side. The M6 was built just long enough ago that its designers were required to make the Gravelly Hill Interchange horse-friendly. There had to be room for ropes to pass along the towpath without obstruction, so the motorway pillars were kept just far enough out of the way to ensure this. An old twisty bridge still carries the towpath over the water - head this way to discover more. 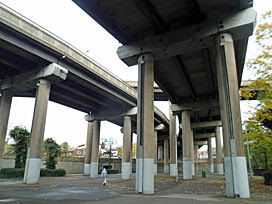 Climb up to the road bridge to discover the point where Spaghetti Junction touches down. This is Salford Circus - nothing to do with a Manchester suburb, more a giant roundabout carved out of the heart of an existing community. There are six roads on and six roads off, two of these for motorway traffic only. Pedestrians aren't allowed to walk around the edge, but can gain access to the heart of the citadel via a tiled subway. The A5127 powers across the piazza on stilts, threading precisely through the A38 sliproad, much higher than you'd normally expect. No traffic is visible from this low down, just a feeling of isolated disassociation. 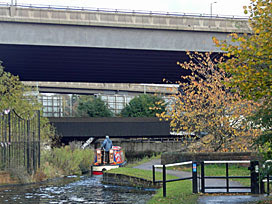 Back over Salford Bridge is the Tame Valley Canal, along whose line the remainder of Spaghetti Junction lies. A modern tunnel has been created beneath a pair of sliproads - letterbox-shaped in profile, with a broad towpath that's damp and uneven underfoot. This one takes more courage to walk through, being a little too long to clearly make out what or who might be waiting for you in the gloom. But brave it out and you emerge at the heart of the machine, with buses and cars and lorries rising up a curving slope alongside. Additional sinuous routes swirl all around, each individual strand linking to a different corner of the metropolis. At Spaghetti Junction the motorist is king, but the canal offers pedestrians, cyclists and bargees a privileged glimpse into their secret world.